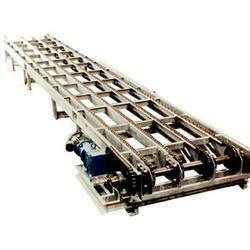 Leading Manufacturer of chain conveyors from Ghaziabad. We are a reliable manufacturer offering an extensive product line that includes Chain Conveyor. Clients actively use our range of chain conveyors in product handling. It is prominently used in systems handling cartons or tote bins and heavy loads such as pallets, drums, collapsible pallet boxes. It is mostly installed in warehouses, manufacturing areas and in mail order or sorting houses.